We are now into the second phase of the L'Etape du Tour de France training club. This 'Late Base' training phase aims to build upon the excellent work completed in the 'Early Base' block of training. The goal of this phase is to extend the time completed at intensities just under threshold. Much of your day in L'Etape du Tour de France will be spent at a sub-threshold intensity, so it's important that this aspect of your fitness is fully developed. Training in this phase will also prepare for the high-intensity work expected in the next training phase. Sub-threshold intervals are an integral part of building aerobic endurance. This style of training results in a high oxygen consumption which provides the boost to your aerobic system. Simply, sub-threshold training helps your body utilize fuel more efficiently for long rides and races keeping you fresher for a final effort at the end. In addition to the structured workouts, the Late Base training phase will also include a free-ride session. This session provides you with the opportunity to complete the many long climbs available on Zwift. In these free-rides, look to increase the amount of elevation gain you completed in the free-rides from the Early Base training phase. If you have more time on the weekend, look to ride outside in a group and work on the dynamics of riding with a bunch of people and pacing. Zwift should complement your cycling lifestyle and schedule. While the focus in this block of training is to complete a high volume of sub-threshold work, it's important to include some unstructured high intensity. This is where Zwift racing is ideal. Each week, look to compete in a Zwift race of your choice and challenge your high-intensity fitness. You can perform the workouts at any time that suits you and you are not date-restricted. 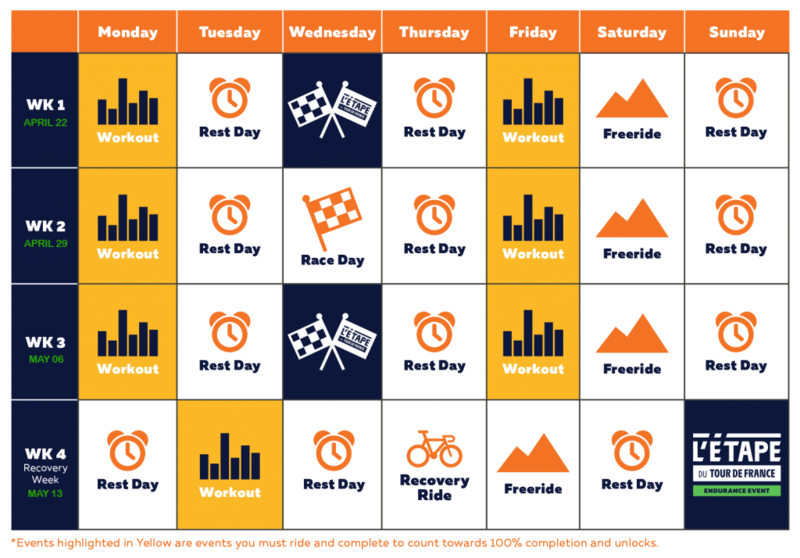 This training schedule can help map out which days you do what. Use it as a guide and feel free to switch up days to best suit your schedule. Recovery is as important as training during this period. Remember, if you’re feeling sick or stressed, rest is often the best option. Workouts highlighted in Yellow must be completed to count towards completion to receive unlocks. These workouts can be found in the workouts dropdown in Zwift by April 22. You will receive completion email once all Phase 2 workouts have been completed from start to finish. Sub-threshold intervals are an integral part of building aerobic endurance. By training at an intensity slightly lower than threshold, you are able to complete large volumes of work with minimal anaerobic impact. Completing sub-threshold intervals results in a high oxygen consumption which provides the boost to your aerobic system. Find a Zwift L’Etape du Tour de France Training Race in the events calendar here or check on the Zwift Companion app. Go hard and see how you stack up. We’ll use this as a benchmark of your fitness. In this session we include short, controlled intervals above threshold with minimal recovery. This type of training provides the perfect stimulus to increase mitochondrial density and sustainable power. There is a sting in the tail though. The session finishes with a 10 minute sub-threshold effort. There is no getting away from the benefits of long aerobic intervals. Ride a route in Zwift with more than 2000ft of climbing. If you’ve done this route before aim to climb just a little faster than before and see how that feels. It should not be an all out effort. Just a slight raise in pace. Head outside and join a friend or local group to get in some solid endurance miles. Don't worry about managing your efforts, just go with the flow, have fun, and get used to riding in a group. Sub-threshold intervals are an integral part of building aerobic endurance. By training at an intensity slightly lower than threshold, you are able to complete large volumes of work with minimal anaerobic impact. Completing sub-threshold intervals results in a high oxygen consumption which provides the boost to your aerobic system. This is an important aspect of your preparation. Find any Race in the events calendar here or check on the Zwift Companion app. Go hard and see how you stack up. Use this to measure your fitness. The focus today is on your ability to produce a steady Zone 3 effort after first completing some high-intensity accelerations. However, across the course of the session, the intensity and duration of the Zone 3 interval will increase. Ride a hilly route of your preference on Zwift. Focus on sustained climbing endurance. Head outside and join a friend or local group to get in some solid endurance miles. Don't worry about managing your efforts, just go with the flow and have fun. In this session, we are focusing on your ability to ride at a tempo effort after first producing a short, high powered acceleration. However, the target power of the tempo interval descends over the course of the effort. 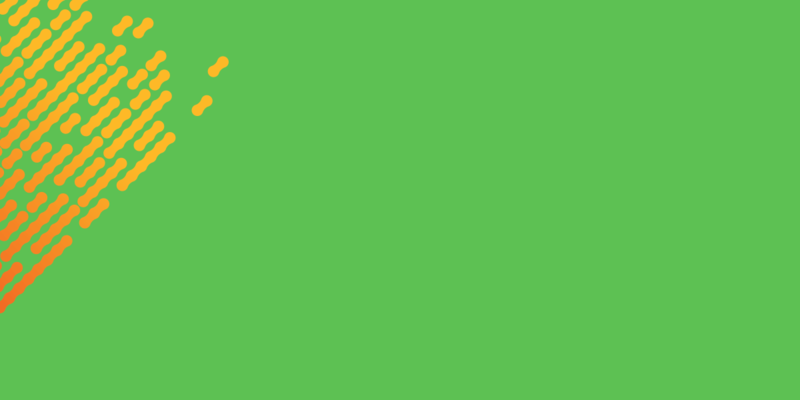 Find a Zwift L’Etape du Tour de France Training Race in the events calendar here or check on the Zwift Companion app. Go hard and see how you stack up. Use this to measure your fitness. Zone 3 training is ideal for building muscular endurance during the late base phase of training. During L’Etape du Tour de France you will more than likely be spending a considerable amount of time at this intensity. To train this area effectively requires completing longer medium intensity intervals. Today’s session consists of 3 x 12 minute Zone 3 intervals. Look to get some good climbing in today. Aim for 3000ft+. Three Sisters route would be a good choice. A lower intensity endurance session today that incorporates 30-second surges. However, with ample recovery, you should be hitting each effort refreshed. Find any route that looks fun to you and ride and at endurance pace, or join a community group ride. Want to ride with a friend or 50? Use our new Meetups function in the Zwift Companion app to organize your own group ride. Learn more here. Join and Ride the L’Etape du Tour de France Endurance Training event here. Test your legs against hundreds of others or sit in and focus on pacing. **If you perform a recovery ride on Tuesday, then you should use the Thursday as a rest day or vice-versa. To access these workouts you will need to log onto Zwift to see them. There will be 4 unlocks in total (Cap, Socks, Gloves, Kit) for members who complete the L'Etape du Tour de France Workouts found in-game from the workout menu. You can complete these workouts at any time but the unlocks will only be applied at certain dates. If you complete, for instance, Phase 1 workouts after April 24, no worries, you'll receive your unlock on the next unlock date of May 23. Your unlock/s will appear in your garage on one of the listed dates below. The Zwift L'Etape du Tour de France Training Club. 16 weeks. 4 blocks of distinct training phases. This plan will shape you into the best cycling version of yourself. You’ll need it to take on all 135km // 83.8mi of the 2019 L’Etape du Tour de France and its 4,563m // 14,970ft of climbing. Each of the four training blocks carries a specific focus. Geared toward leveling up your fitness in tangible ways, you’ll come out of every block fitter, faster, and ready to ride. View more details about the L'Etape du Tour de France Training Club here.